New Brunswick, N.J. – After 14 years of providing the public with information on “all things horses,” the Rutgers Equine Science Center (ESC) has had a major facelift, launching its redesigned website to offer greater interactivity, new search functionality, plus a streamlined “Ask The Expert” section. 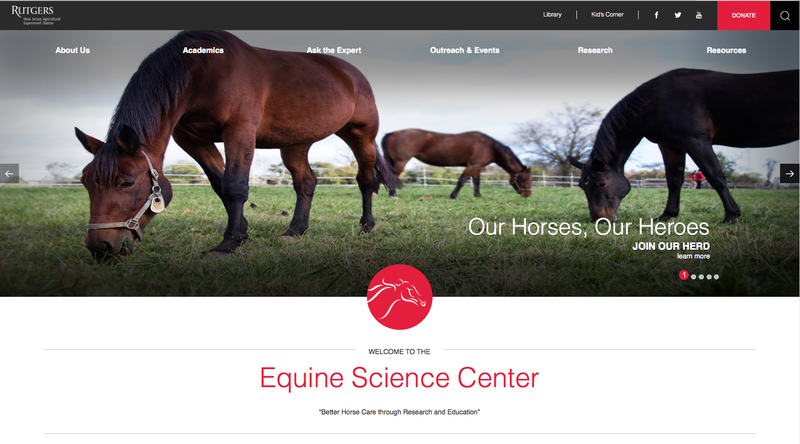 “With this facelift and integration, the center will provide the public with a website that is not only friendly to use, but one which will remain unparalleled in providing science-based information to equine enthusiasts around the world,” says Karyn Malinowski, director of the ESC. The popular “Lord Nelson’s Blog,” whose four-legged author recently received the “Horse Personality of the Year Award,” will migrate from its current site to anchor a special “Kid’s Corner” on the center’s new website. “Kid’s Corner” will also feature the “Equine Science 4 Kids” education portal as well as link to the 4-H Horse Program in New Jersey. “‘Kid’s Corner’ will give kids and teens a place where they can learn about horses, the science behind the center and how they can get involved in the statewide 4-H Horse Program,” says Malinowski. The new search functionality will allow users to search, not only the site, but the PDF publications and brochures. Specific sections, such as the blog and “Ask The Expert,” will have siloed search options “so that users will be able to search those sections, only getting search results that are pertinent to their topic of interest,” adds Malinowski. The “Ask The Expert” section will now allow users to ask horse-related questions directly on the page, says Malinowski. Questions will now require users to enter their location, which will in turn populate a real-time map displaying the locations from where the question originated. Currently populated with the locations from previous questions, the map shows that over 2,000 questions have been posted from all 50 states in the U.S. 28 different countries and all 6 continents. The site’s redesign and overhaul was performed by Nickelfish of Mendham, NJ.